Captain Don Bryan of the 328th FS, 352nd FG rolls out behind an Arado 234 "Blitz" bomber flown by Hauptman Hirshberger of 6./KG 76. The action took place on the afternoon of March 14, 1945. While returning from escorting B-26 and A-26 medium bombers, Bryan spotted the AR-234 making a bombing run on the pontoon bridge at Remagen. To compensate for the jet’s superior speed, Capt. 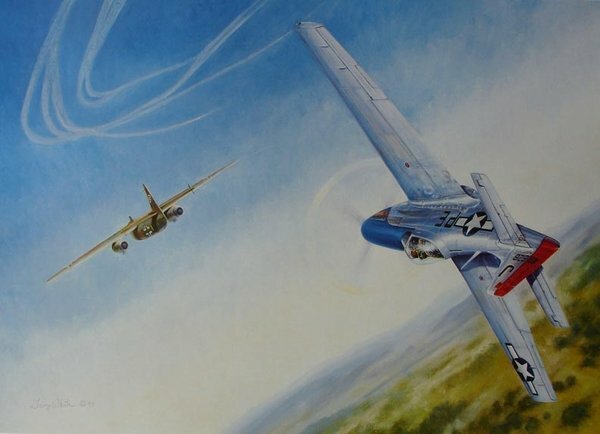 Bryan positioned his P-51 Mustang so that the German would have to fly toward him after his attack This Arado was Bryan’s 13th and final air-to-air victory of WWII.